The Donald does not fux with Starbucks's Christmas imagery-free holiday cups. Presidential hopeful and comb over-enthusiast Donald Trump recently took a stance on one of most important issues of our time. No, not immigration or healthcare, but Starbucks’s annual holiday red cups. 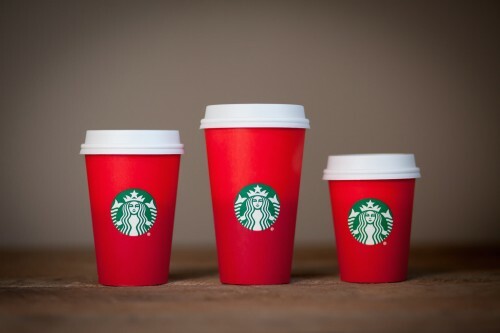 This year, the coffee giant debuted a two-tone red ombré cup free of Christmas imagery like reindeer and ornaments. This angered a few overly caffeinated evangelical Christians. One man even went so far as to say that Starbucks was just a bunch of Frappuccino-slinging Jesus haters. The Donald agrees, and is calling for a boycott of the secular coffee chain, writes CNN. Trump proclaimed to a crowd in Springfield, Illinois on Monday: “I have one of the most successful Starbucks, in Trump Tower. Maybe we should boycott Starbucks?… That’s the end of that lease, but who cares?” The smooth, suave, and always politically correct orator then declared, “If I become president, we’re all going to be saying Merry Christmas again, that I can tell you,” managing to ignore the fact that not everyone in America celebrates Christmas. Still, Trump’s cries for a boycott at least have sound financial logic, unlike plans by Josh Feuerstein, a self-proclaimed social media personality and Arizona-based evangelist. Feuerstein released a video earlier this month in which he encourages Christians to not boycott Starbucks, but instead visit the chain, order a drink, and tell them that their name is “Merry Christmas,” so that employees will be tricked into writing the phrase on to the holiday cups. Feuerstein just forgot one little thing: By encouraging people to visit Starbucks and buy drinks, he isn’t exactly punking the chain, but instead giving it more business. Oops.